Little Wonder is known for their top performing commercial blowers and vacuums, but that focus on design isn’t limited to their largest machines. Their gas trimmer is built for landscapers who need something that works day in and day out, while their electric models carry many of the same features, making them easier to use than comparable consumer models. Little Wonder knows these trimmers will be bought by people who will put some serious time into trimming, so they’ve taken steps to get better wear and comfort than run-of-the-mill models. This starts with a blade made from a high carbon tool steel, giving it enough abrasion resistance to last 6-10 times longer than standard blades. These blades are driven by the motor through case-hardened steel drive gears. This process creates a super hard outer surface around softer, less brittle metal, making them hard wearing and shock resistant. While other trimmers have a single blade moving back and forth, Little Wonder uses dual reciprocating blades. By moving in opposite directions, these blades counteract the forces of their motion, reducing vibration. 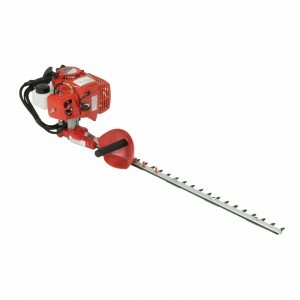 The 2230 is a gas-powered trimmer built for landscaping. Power comes from a 21.2cc two-stroke engine. It’s CARB-certified, so it’s legal to use in California, and it has an electronic ignition and primer bulb carburetor, making it easy to start. The fuel line is weighted, keeping it in place to supply the engine with fuel and oil no matter how the trimmer is tilted. The two position handle is attached with shock mounts, reducing hand stress and keeping vibrations at bay. For safety, the finger throttle is fitted with lockout to prevent accidental drive engagement. The 2230 has a 30-inch long single-sided blade that can make up to 3,500 cuts per minute and can go through branches up to one inch thick. This model weighs just 12.25 lbs. Little Wonder guarantees this trimmer for 5 years, the longest warranty in the industry. Little Wonder’s electric trimmers are powered by a motor that draws 4.5 amps at 462.33 watts, which is enough to cut 2,700 times per minute with the strength to slice through branches up to ½ inch thick. Thanks to redesigned gears with angled teeth, the drive system is stronger than earlier models and runs 20% faster. This gearset can be retrofitted to older trimmers. There are four models available, letting you choose two lengths of single and double-edge blades. The single edge trimmer weighs 7.9 lbs. with a 24-inch blade and 8.8 lbs. with a 30-inch blade. The double edge models weigh 8.4 lbs. with a 24-inch blade and 10.1 lbs. with a 30-inch blade. Like the gas model, there are switches on both handles that have to be on for cutting. A built-in blade brake goes beyond legal safety requirements, stopping the blades in less than half a second with triggers are released. The base of the handle has a place to hook the extension cord to keep it from becoming disconnected. Improvements to the overall design have cut nose by 10 db at operator’s position and by 8db in total noise level during operation. Like the 2230, care was taken to ensure reliability and easy servicing. Both ends of the motor shaft ride on ball bearings, increasing the motor’s life and reducing the amount of heat it generates. A small cap built into the top of the trimmer can be removed to access the motor brushes and gear case without taking the entire back of the trimmer apart. All electric models are backed by a two-year warranty. Shank’s Lawn Equipment sells and services most professional outdoor equipment brands including Little Wonder. If you’re looking for a new trimmer or you need to have your current equipment serviced, visit us at 4900 Molly Pitcher Highway in Chambersburg, PA.
Are you looking to upgrade your trimmer’s gears? Do you need other parts for your Little Wonder? We ship OEM replacements across the U.S. and Canada. To order, visit us online at www.shankslawn.com. This entry was posted in Uncategorized and tagged Hedge Trimmers, Little Wonder, Little Wonder Hedge Trimmer, Shank's Lawn. Bookmark the permalink.